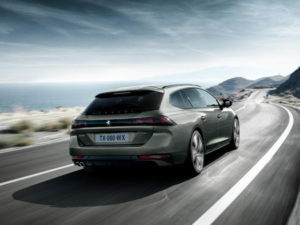 Peugeot has unveiled its 508 SW estate as it puts the focus on both style and practicality for the D-segment estate car market. Providing a rival to models such as the Skoda Superb Estate and Vauxhall Insignia Sports Tourer as well as competing SUVs, the 508 SW follows in the footsteps of the recently unveiled 508 saloon in seeking to reinvent the sector through a mix of sleek design – including frameless doors – and premium approach. Due to be revealed at the 2018 Paris Motor Show and available in the UK from January 2019, the 508 SW is built on PSA’s EMP2 platform, making it an average of 70kg lighter than the outgoing generation. Only slightly lower and longer than the saloon, the estate brings boot space of 530 litres with the rear seats in place and luggage cover in situ, rising to 1,780 litres in total. It also features the Magic Flat function, allowing the driver to fold back the two sides of the rear bench seat, and a hands-free, powered tailgate. Emphasising Peugeot’s premium approach, the 508 SW gets the brand’s i-Cockpit digital dashboard, ergonomic, wrap-around seats offering five multi-point massage programmes and the option of a top-of-the-range hi-fi system designed by FOCAL. New safety features for the range include adaptive cruise control with stop & go function, lane keeping assist and a night vision system that can detect humans or animal in front of the vehicle in low-visibility conditions – said to be a first for the segment. Engine line-up brings PureTech and BlueHDi petrol and diesel engines along with a plug-in hybrid petrol due in the second half of 2019. This uses batteries located under the rear seats to retain boot space and offers an electric-only range of 50km (31 miles) on the WLTP cycle. Petrol units comprise two 1.6-litre units offering 178bhp or 222bhp, both featuring the new EAT8 eight-speed auto and equipped with a ‘freewheeling’ function in Eco mode that can cut fuel consumption by around 3%. Diesels comprise a 128bhp 1.5-litre with either the eight-speed auto or six-speed manual, along with a 158bhp and 178bhp 2.0-litre with the auto only. Petrol engines are certified to Euro6d-TEMP and diesel engines are certified to Euro6d-TEMP-EVAP.